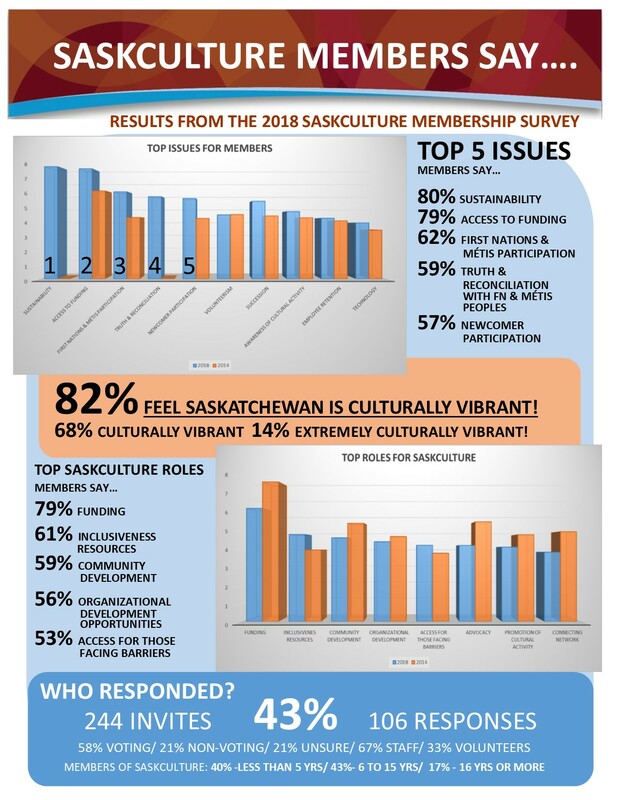 Sustainability, access to funding and First Nations & Métis participation were the top three issues for SaskCulture members completing the 2018 SaskCulture Membership Survey. In October 2018, SaskCulture sent out a survey to its members to help determine the level of member satisfaction with SaskCulture programs and services. A total of 244 invitations went out, reaching executive directors and board presidents of SaskCulture’s 170 member organizations. According to these respondents, members have a reasonably strong awareness of SaskCulture and its programs and services, and are generally satisfied with SaskCulture’s direction. The survey results are an important way of helping SaskCulture continue to improve its programs and services and remain relevant to its key stakeholders. Check out what SaskCulture Members had to say!